For well over a decade, the R8 has represented the pinnacle in Audi 's performance range. Although Audi has recently been ramping up its electrification efforts with the unveiling of the E-Tron GT Concept, Audi has also updated both the R8 Coupe and Spyder for 2019 with sharpened styling, revised suspension and more power from the car's infamous 5.2-litre V10 engine. As a result, the new R8 is the fastest and most powerful road-going Audi ever built, but can it match the prowess of supercar alternatives such as the McLaren 570S, Mercedes-Benz AMG GT and Porsche 911 GT3? We went along to the official launch of the new model to find out. The very first Audi R8 (launched in 2007) championed a 4.2-litre V8 petrol engine, though this was soon replaced in favour of the naturally-aspirated 5.2-litre V10 FSI engine that has powered the R8 ever since. Although most of the R8 's rivals are powered by turbocharged units, Audi has retained the high-revving (8,700rpm redline) naturally-aspirated V10 unit that we all know and love. The V10 has been tuned and it now churns out 30 more horsepower than its predecessor for a total output of 570 horsepower and 560Nm of torque; impressive! 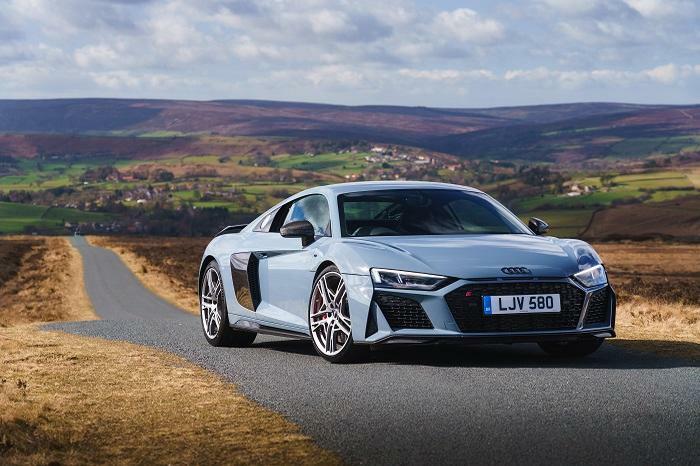 Audi has also introduced an upgraded R8 ‘Performance’ model to the range that replaces the R8 ‘Plus’ of old, and it boasts monstrous credentials with power upgraded to 620bhp. The R8 lays its power on the road through Audi ’s quattro all-wheel-drive system and a seven-speed S Tronic automatic transmission, covering 0-100km/h in just 3.4 seconds (3.1 seconds for the performance) and reaching an eventual top speed of 324km/h. It accelerates with astonishing pace and pins you to the driver's seat under hard acceleration, with a gorgeous howl from the high-revving V10 engine. The sound from the R8 's engine is blissful and it eaves you never wanting to turn on the sound system. The R8 prioritises comfort more than its track-focused rivals, such as the McLaren 570S, and it has gained a reputation for being the ultimate everyday supercar. Further platform updates improve ride quality for 2019. We were impressed by the R8 ’s all-rounding abilities on the twisty back roads of the Cotswolds countryside, and surprised by how quiet and refined it is in ‘Comfort’ mode. 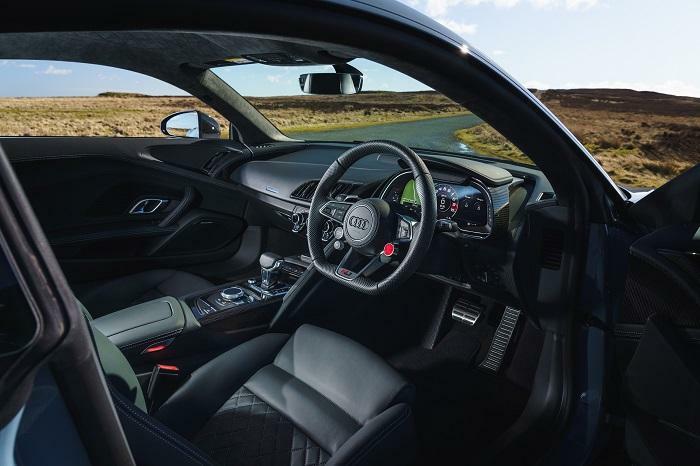 Selecting ‘Dynamic’ through the steering wheel controls transforms the experience, and the R8 becomes a fire-breathing, grin-inducing super car with heightened throttle and steering sensitivity. Audi has revised the R8 ’s suspension for more precision during cornering, and it is certainly evident during spirited drives. The R8 tackles apexes with pinpoint-precision and enormous levels of traction from the famed Quattro all-wheel drive system. The end result is a confidence-inspiring drive; which is rather impressive with 620 horsepower to tame. The steel rotor brakes have been updated for added stopping power, while the Performance model gains upgraded carbon ceramic brakes for extra bite. Although the new R8 isn’t entirely as track-focused or adjustable as class alternatives as the McLaren, it strikes an ideal balance between performance and practicality for every day needs. The R8 ’s styling has evolved subtly rather than radically for 2019. The most notable change is a revised front end with a wider and flatter single frame grille, an it even borrows styling inspiration from the latest Audi A1 supermini. 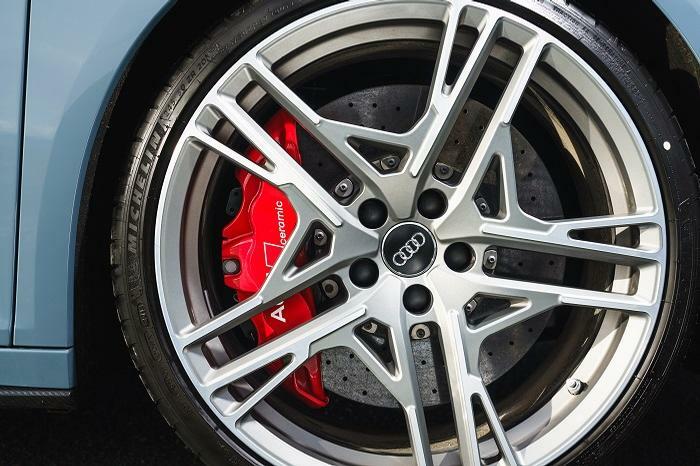 Audi has also tweaked the R8 ’s alloy wheels slightly, and it looks sleeker than ever before. 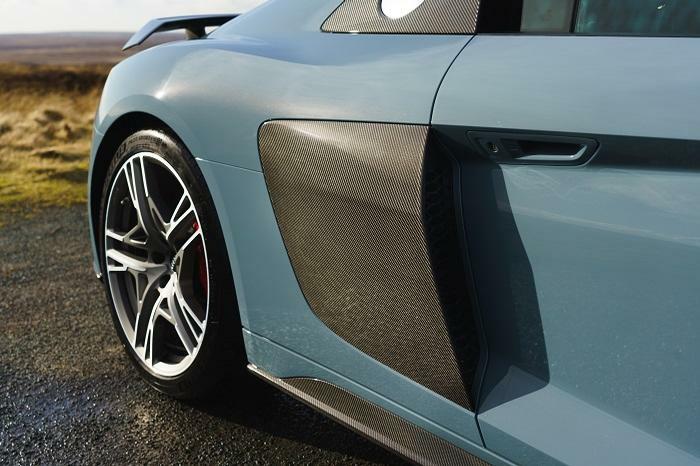 The upgraded R8 Performance benefits from larger 20-inch Titanium alloy wheels, carbon-fibre ceramic brakes and various other styling enhancements including gorgeous gloss carbon inlays. We spent time behind the wheel of both the base and upgraded performance models, including this Kemora Grey R8 Performance (pictured). 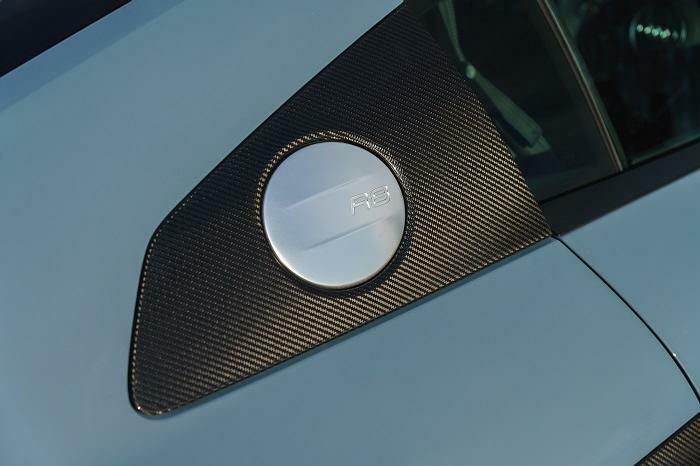 Details such as the striking carbon fibre side blades and black Audi ringlets further enhance its appeal. 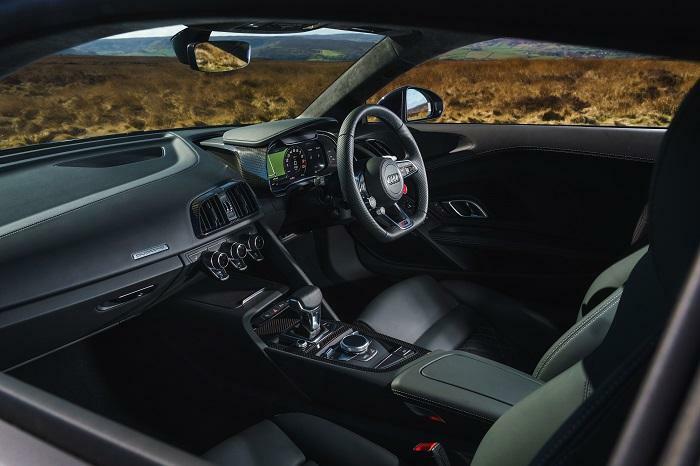 Inside, the Audi R8 is a technological tour-de-force and it offers one of the most accommodating supercar cabins on the market. Little has changed inside, though a reversing camera and parking assistance are now featured as standard; a welcome addition when nestling the wide-bodied R8 into tight parking spaces. The cabin is very inviting, with enough room to accommodate two tall adults and several storage areas throughout the cabin including a pair of coffee cup holders. Luggage space is limited to the say the least with a mere 112 litres of space under the front nose which equates to two small suitcases. 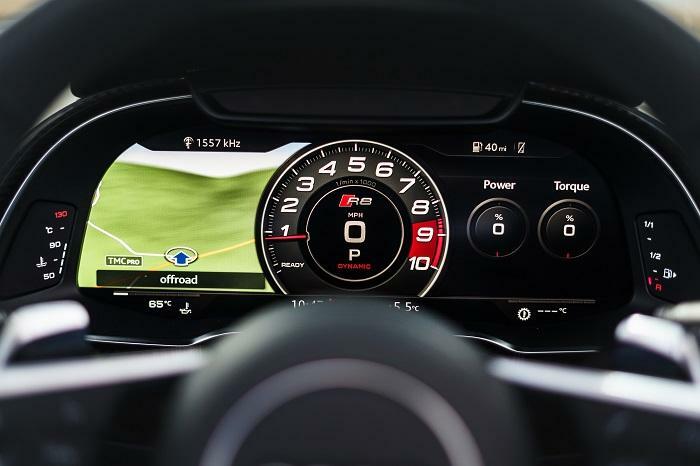 All of the R8 ’s functions are displayed on a vibrant Audi Virtual Cockpit digital cluster display behind the sports steering wheel, while the infotainment is controlled via easy-to-use steering wheel controls. The absense of an additional touch screen in the centre console allows you to concentrate purely on the driving experience. Prices for the new Audi R8 start from €237,920 for the Coupe, or €260,850 for the summer-orientated Spyder. Those lusting after the more powerful performance models will have to fork out €270,910 for the Coupe, or a whopping €293,840 for the Spyder. Despite this, the R8 remains considerably more affordable than many of its rivals such as the McLaren 720S and Mercedes-Benz AMG GT, even though it’s on par in performance terms. In terms of running costs, the R8 has a sizeable annual motor bill (€2350), while Audi claims combined fuel economy returns in the region of 21.6l/100km, so it's going to be expensive to run. The V10 Quattro is equipped with an enviable list of standard equipment, includng 19-inch twin-spoke alloy wheels, All-LED headlights, deluxe automatic air conditioning, chrome-plated dual tail pipes, nappa leather upholstery, Audi ’s MMI and virtual cockpit systems, sports heated seats, a retractable rear spoiler (coupe only), Audi ’s parking system plus a reversing camera, and the list goes on. 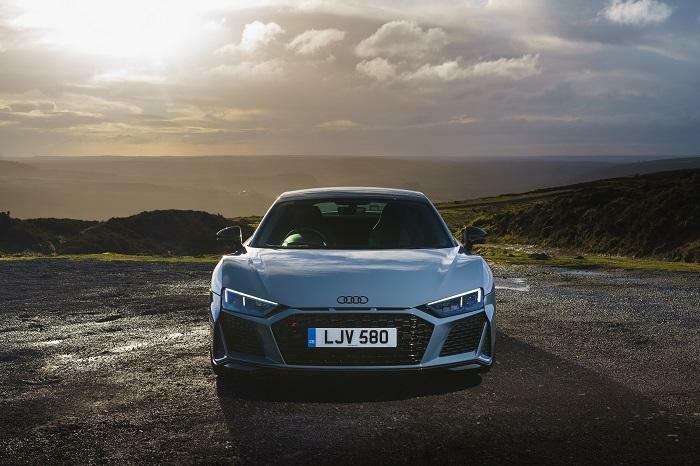 The new Audi R8 pushes the envelope further, buillding on the attributes that have made it one of the most successful supercars of recent times. It's faster, it's sleeker and even better suited to daily driving, with added agility on track. The new front-end redesign gives the R8 a sharp new face, and kudos must also go to Audi for squeezing even more power out of the naturally-aspirated V10 powerplant. Although other supercars offer more outright performance in a race circuit setting, the R8 remains the best supercar for everyday needs, and it is likely to remain so for the forseeable future. 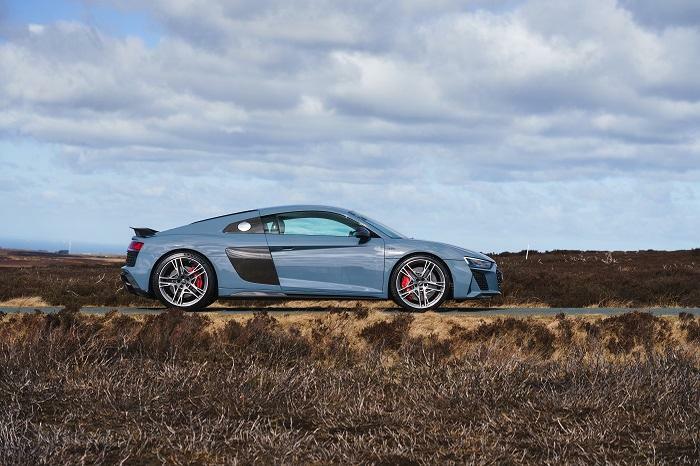 We drove the new #Audi #R8 at its official launch with @Audi ireland recently.